Wood is a tough competitor. With its long history, its many virtues, and its popularity, wood once dominated the fencing market. However, these days it must compete with technologically advanced materials, many of which offer exceptional benefits at a great value. So who could possibly compete with wood? Vinyl, that’s who! First introduced in the 1980s, vinyl fencing lasts much longer than wood, requires virtually no maintenance, and won’t be destroyed by wood’s archenemies (termites, fungus, dry rot, and fire). However, vinyl is somewhat more expensive than wood. So which should you choose if you’re planning to build a new fence: wood or vinyl? We’re going to make your decision a little easier by pitting wood vs. vinyl fencing in a head-to-head match. Who will the victor be? Stick around to find out! Which product is stronger? Which can withstand turbulent weather? Which will live the longer life? Vinyl wins this first match hands-down. Vinyl can stand up to harsh weather, pests, decay, and fungus. In fact, without any help from you, it can easily last decades. Although wood can last around 20 years, it will break down over time and you will have to repair and replace the fence’s lumber. The type of wood will affect the product’s durability as well, as some species of wood are more structurally strong and resistant to rot and decay (cedar and redwood are best). If you want your wood fence to last awhile, you will need to invest in a pressure-treated and chemically-treated product, and you may need to apply a preservative sealant. What a hassle! Stick with vinyl if you want a strong, long-lasting fence. Winner: Vinyl is the clear victor when it comes to wood vs. vinyl fencing durability. Vinyl fencing requires no maintenance whatsoever. Although you may want to hose it off from time to time to remove built up dirt, that chore will often be performed by the rain! Wood, on the other hand, requires an abundance of work if you want it to look clean and presentable and last for many years to come. It will need to be cleaned periodically, treated, stained every year for the first three years, and stained every other year after that (and unfortunately, staining can be expensive and time-consuming). Plus, wood rots as the years go by. As it warps and begins to fall apart, you will need to replace the damaged lumber. Winner: Vinyl wins by a landslide, because it requires virtually no maintenance at all. Vinyl is more expensive than wood at the outset. After your initial investment, however, you won’t have to pay anything. Except in cases of extreme weather, your vinyl fencing should stay secure and beautiful for years and years to come without costly maintenance or repairs. Wood, while cheaper upfront, does require frequent treatments and stains. And because it doesn’t last as long as vinyl, you will probably need to replace the fence at some point if you live in your home for longer than 10-15 years. When considering wood vs vinyl fencing, also consider the size of your project. If your budget is small but your yard is large, you may want to go with wood (unless you plan to live in this home 15 years down the line). But if the area you will be fencing in is small and you can afford the upfront cost, choose vinyl. Winner: Wood costs less upfront, but vinyl is a better value in the long run. Many people prefer the look of a real wood fence. It is traditional, offers an all-American appeal, and has a lot of character. However, wood also breaks down more quickly. Although it will arrive in mint condition, over time it may become discolored, decayed, rotten, and perhaps even consumed by termites or other pests. All this to say: if you want your fence to remain pristine and beautiful, choose vinyl. You won’t have to worry about chipping paint, fading stain treatments, termites, or weathering. Plus, vinyl is now available in a variety of colors and styles, some of which even mimic real wood. Whichever material you choose, be sure to select a high-quality fence and have it installed correctly, as these factors will influence the fence’s aesthetic appeal as well. Winner: This depends on your style, but vinyl remains beautiful for longer. Wood vs. vinyl fencing: which is best? With its lengthy life, lack of maintenance, formidable strength, and beautifully versatile appearance, vinyl should be your preferred choice for fencing. Although it is more expensive upfront, it provides a better return on investment and won’t require regular (and costly) maintenance like wood fencing. Unless you’re looking to fence a very large area and you also don’t plan to live in your current home very long, we promise that you will be happier with a vinyl fence in the long run. PolyVinyl Fence Systems: The PolyVinyl system includes a variety of fence styles: privacy, semi-privacy, picket, and ornamental. Many of the sections are aluminum reinforced and include aluminum post stiffeners, and you can choose from a variety of post caps and classic colors. The gate systems feature corrosion-resistant screws for long-term strength, and adjustable hinge hardware provides accurate alignment. Plus, they are all made in the USA! PolyRail Vinyl Fence Systems: The PolyRail system is a green series that provides inexpensive and lifelong beauty. 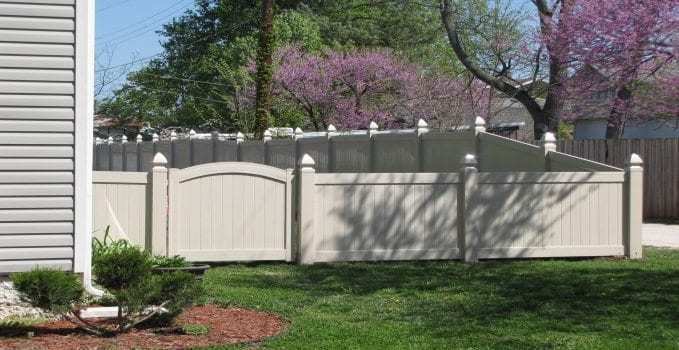 The series includes privacy fences (tongue-and-groove), yard fences, picket fences, and post-and-rail fences, which are all available in white and tan. Interlocking fasteners ensure that the privacy fences are stable and secure, and matching gates are available for many of the product lines. Plus, heavy-duty frames are available for some of the post-and-rail fences, allowing for equine applications. Designer Fencing: The Designer Fencing system is available in three heights, 48″, 60″, and 72″, and aluminum frames can be purchased separately. There are nine standard in-fill colors (white and various shades of tan and light brown), and eleven colors for the aluminum components and gate frames (black, white, tan, gray, brown, and green). Plus, the product is wrapped in secure, three-step packaging to ensure that it arrives free of damage. All of these options are affordable, beautiful, and virtually maintenance-free. Plus, our vinyl fencing systems all come with a transferable lifetime limited warranty! To get started, please visit our online store, request a quote, or give us a call at 1-866-931-5002.